Did you know that small businesses can save up to 35% on HR administrative costs when they use a PEO? PEOs also provide a slew of other benefits, including better service offerings, lower turnover rates, and stronger business growth. But before you can decide whether any of those benefits are right for your small business, you need to ask some hard questions. How will a PEO partnership change your business function? Is this the right decision for your employees? How does payroll work with a PEO? And perhaps the most pressing question: What is it going to cost? 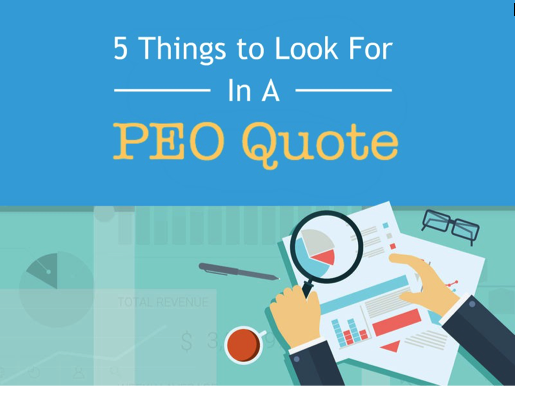 The PEO quote can be tricky to read, mainly because there is no standard pricing format. Each PEO will present the quote differently, and it’s up to you as the client to figure out how various cost estimates compare. Will they provide an unbundled quote? An unbundled quote lists all of the fees line by line so that you can see exactly what you will be charged for each service. It’s the best way to compare quotes and be sure you aren’t in for a surprise down the road. But unbundled pricing isn’t necessarily a given. Some PEOs bundle pricing together so that the cost of individual fees isn’t immediately apparent. If that’s the case, ask for an itemized, unbundled cost breakdown so that you can compare and contrast specific costs from one PEO to the next. With that in mind, let’s take a look at the 5 elements of the PEO quote. Employers must withhold FICA taxes from employee paychecks and pay them to the IRS. You’re already paying these taxes now, and the PEO will simply pass on the cost to you when they take over the responsibility for payroll. The FICA cost should remain consistent from PEO to PEO. FUTA is also a payroll tax, and it is designed to provide unemployment payments to employees who lose their jobs. 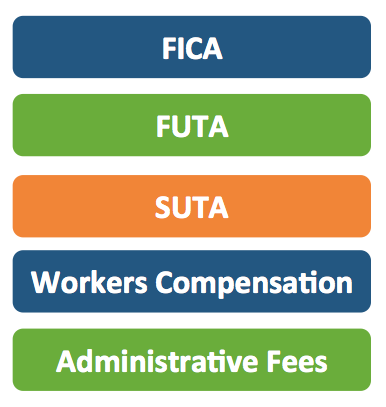 Like FICA, FUTA remains consistent based on federal mandates. This is where the quotes begin to vary. Because states determine their own SUTA rates, the rate will be different for a business in Florida as compared with one in California. A PEO that operates in multiple states will charge a different SUTA rate in each state. Rates also vary based on the number of unemployment claims a business has and their turnover rate, so a new business may pay more than a business that has been operating for three years with very few claims. As you compare quotes, look at each of the workers’ compensation codes that you currently utilize and compare them with the rates offered by the PEO. The hope is that the PEO will be able to offer you a cost savings on each of those codes, but that is not always the case. A PEO’s rate may increase due to their number of claims. They will either pass this on to you as the client or charge you a lower rate than they pay. The workers’ compensation fee may also include co-pays, deductibles, and incentives for remaining accident free. Be sure to look at each itemized element of the fee so you can get an accurate picture of what you’re paying and whether you’re saving money or paying a higher rate than you would independently. Administrative fees may be charged either as a flat fee per employee or as a percentage of payroll. Admin fees can get tricky, however, because they often include value-added service fees that vary widely and may not be stated up front. In some cases, the PEO will negotiate pricing based on the rates you could get on your own, and they might be willing to carve out parts of the quote if you want to keep your own policy. By educating yourself about what to look for, you can pinpoint how much the PEO will charge for each service even if the quote is structured differently, and that gives you the best basis for comparison. Optimize your PEO research efforts with our PEO Matching Tool! Our tool saves you hours of research and matches your business with a short list of PEOs based on your unique requirements.